After my beach run in Cape Cod we decided to head north. 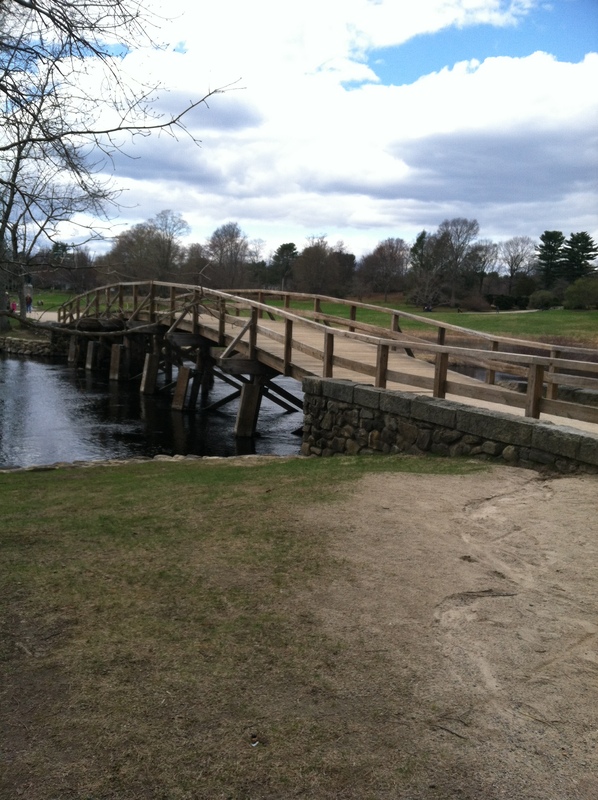 Our final destination was Portsmouth, New Hampshire – as suggested by DarlinRae and PirateBobcat. When I was planning our trip out east there were two things that I was interested in: beaches and history. Cape Cod took care of the beaches and our next stop was Minuteman National Historic Park between Concord and Lexington back in MA. Learning about the American Revolution back in Ireland – we got the basics tea party, British were bad, George Washington and that’s about it. Now we were getting the real deal. 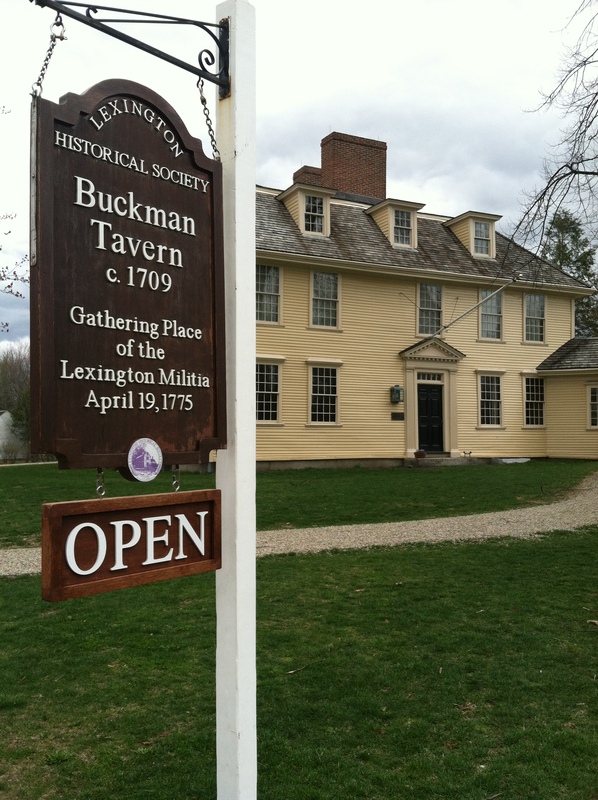 Ye olde tavern in Lexington. I’ve visited my fair share of National Park Visitors’ Centers and I have to say that the one at Minuteman was pretty cool. 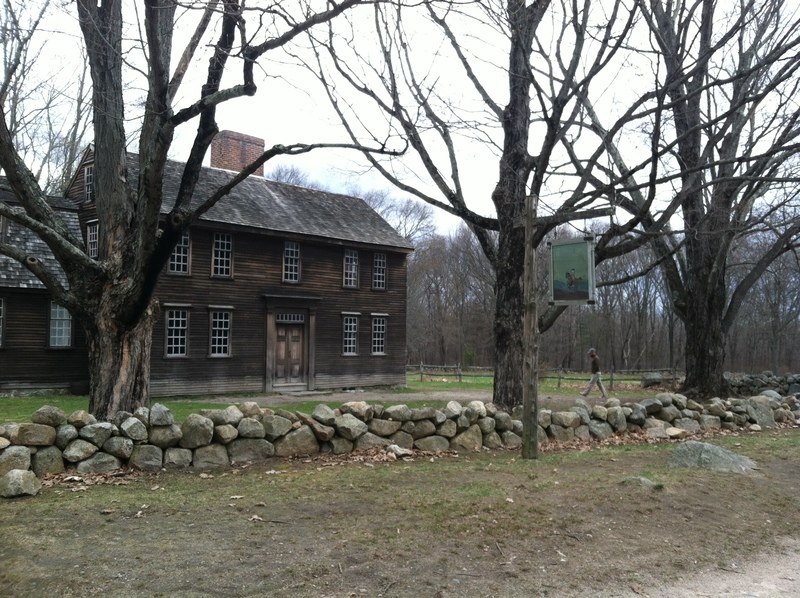 They showed two amazing films – one aimed at kids with muppets singing a Steve Martin song about Paul Revere and another multimedia presentation describing the events leading up to Paul Revere’s famous ride to warn about the Redcoats. Then we followed the historical trail past some historical homes out to north bridge where the first shots of the Revolutionary War were fired. Yet another olde tavern. Check out the painted sign! We did a little detour out to Essex, MA to get our seafood fix – crabmeat roll for me and lobster roll for J. Then we hit the most hipster hotel in Portsmouth, NH. It was a beautiful hotel and really close to downtown. Blue Mason glassware. 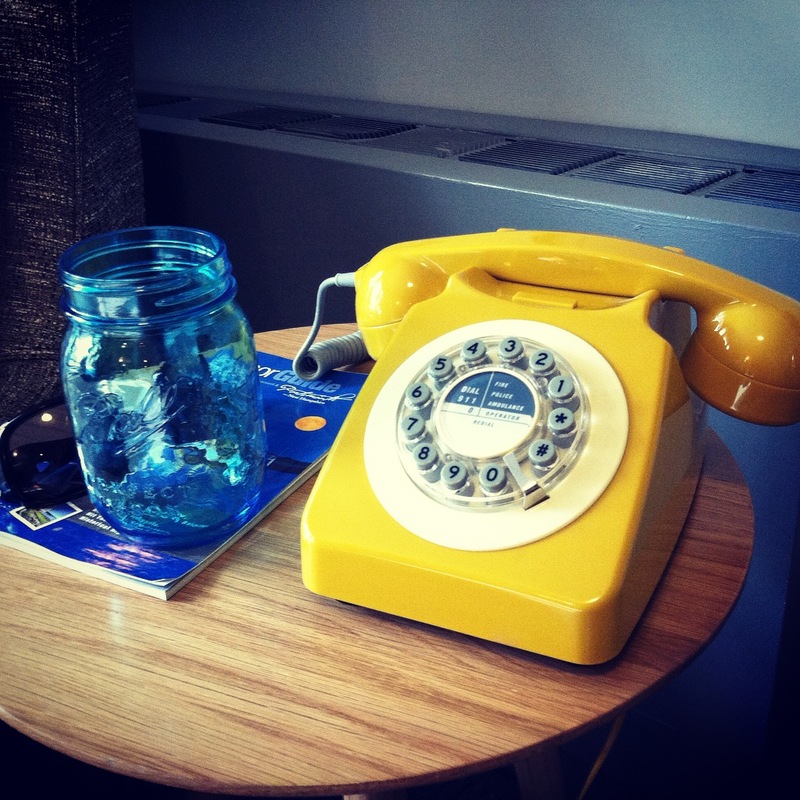 Yellow rotary phone. First stop: Eagle Earth Brewings. About a 5 minute walk from the hotel. 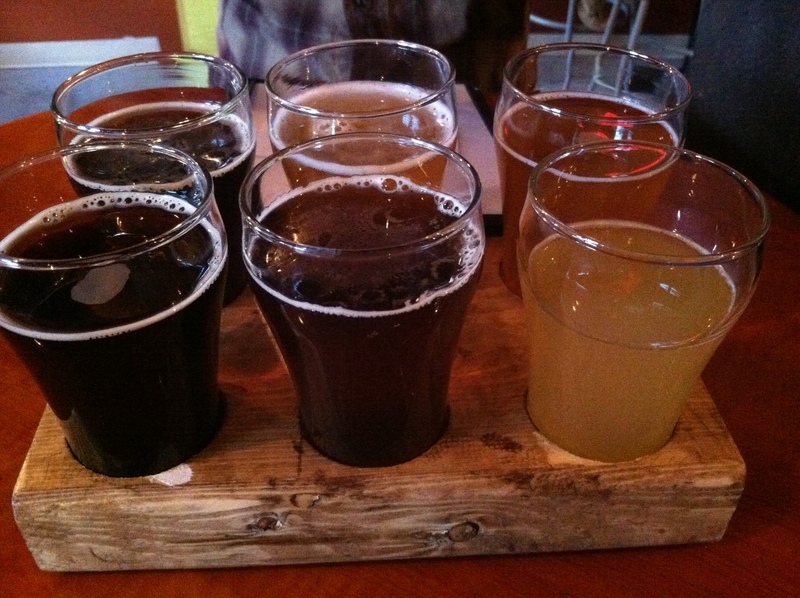 A hip little microbrewery with some awesome beers. We ate at a restaurant called surf that overlooked the harbor: great scallops to start and amazing portabello-stuffed flounder. Next morning: morning run in state number two. It was windy and in the 30s! 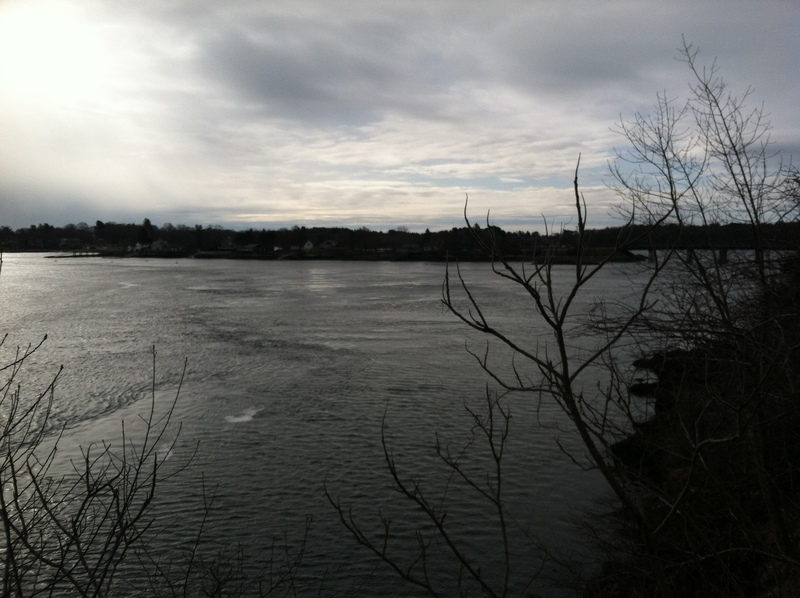 J and I ran to the harbor – his first run since Boston. The naval shipyard was across the water and you could see a submarine moored. I wanted to take a photo but I was afraid of being arrested. We also saw the last remnants of Portsmouth’s snow pile. Pretty glad I wasn’t here in January. 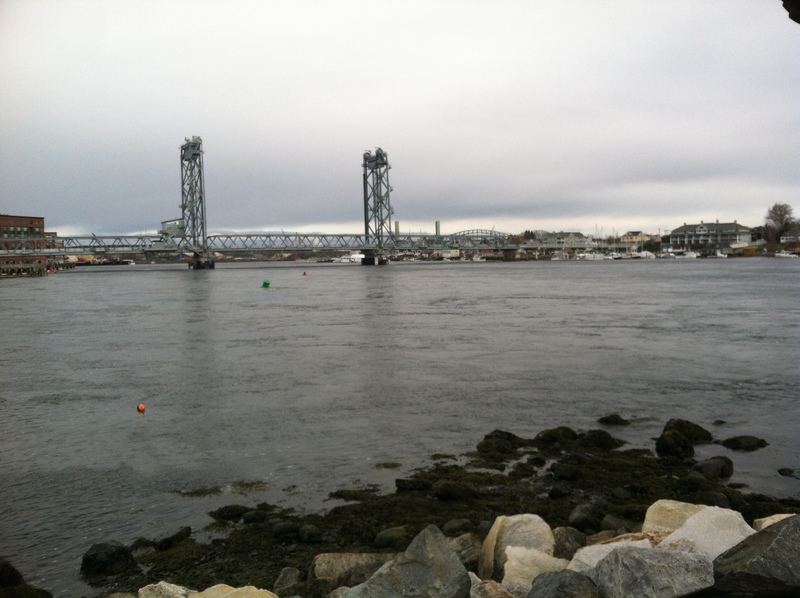 Portsmouth was a cute little town – a smaller version of Portland, ME – our next stop.